"It was love at first sit!" “It’s at the end of the summer of 2006 and I am at the middle of a beach, when I suddenly come to a standstill. A very strange experience, because I simply can’t walk anymore. At least, not without pain. As the weather was great, I decided to sit down and wait until I felt better. Maybe I had just strained a muscle? Back home the pain did not go away and walking got more and more difficult. Until one morning I woke up and found that both my legs were still sleeping and would not wake up with me (and to this day they are still asleep). I compare it to the strange feeling you get in your legs when you’ve been sitting in a wrong position for too long. Wondering what might be the cause I did start to fear that it would probably be something worse than a strained muscle. Reluctantly I made a doctor’s appointment. It was after the holidays, early 2007 when I had my first appointment with a neurologist. It was a relief to find that he took my complaints seriously right away. First he did some tests to rule out other possible causes for my complaints, before I was finally tested for (by use of MRI, Spinal puncture etc.) and diagnosed with MS (Multiple Sclerosis). During the first year good and bad days fluctuated a lot, but I still could “walk”. 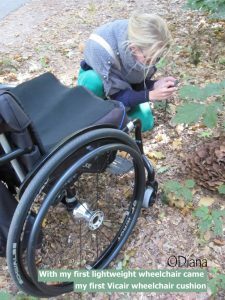 Until the day came that I had to face the fact that, when I really wanted to go out and do something, I would need a wheelchair (at first now and then…). In 2008 I went for my first wheelchair assessment and received a wheelchair. Well… wheelchair, now I call it a wheelbarrow. It was a terribly heavy foldable wheelchair. I couldn’t move it myself, so I always had to be moved around by someone. Later on also a heavy handbike adapter was fixed to it. All of this made it clear that I had to try to get a lighter wheelchair. And so I did. My new lightweight wheelchair was a great relief. It gave me so much freedom! 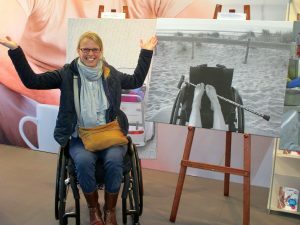 Although it might sound strange, to me that is what a wheelchair brought me: more freedom! By now I was using my wheelchair on a daily basis (both in- and outdoors) and sitting in it started to hurt more and more. To solve this I had been sitting on a Jay Basic cushion, but my technical advisor introduced me to the Vicair Vector 10 cushion. It was love at first sit! 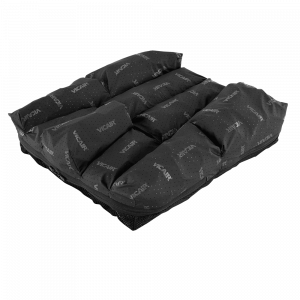 No more pain when sitting, the pain in my tailbone disappeared and the cushion offered me so much more stability! Super! Besides that I really love the fact that the Vector is really lightweight. A few months ago I met the Vicair team at the MS-day of the Dutch National MS Foundation. We agreed to replace the blue SmartCells in my cushions for the new silver-grey versions, in exchange for the right to use the price-winning picture that I had made and that showed my Vector cushion (annual photo contest “I can live with MS”- red.). The new cells are really great! They are even softer to sit on and very comfortable.